Be the first to share your favorite memory, photo or story of Lenore B.. This memorial page is dedicated for family, friends and future generations to celebrate the life of their loved one. ALEXANDRIA, IN- Lenore B. (Richardson) Rector, 97, passed away on Tuesday, July 24, 2018 at Community Hospital in Anderson following a brief illness. 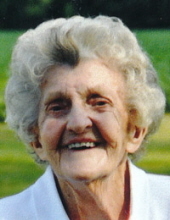 She was born on January 25, 1921 in Perkinsville, Indiana to Ralph and Myrtle (Davis) Richardson and has lived in in the Alexandria area all of her lifetime. Lenore had worked at Essex Wire, formerly of Elwood for 10 years, retiring in 1982. She was a hard working farm wife and devoted herself to her family. She was a member of The Community Church of Alexandria. Lenore enjoyed square dancing, gardening, cooking and canning. Great-Grandchildren-Ali Rudig, Mekayla Rudig, Mathew Rudig, Ava Beck, Mia Beck, Drayton “Grayton” Massengale, Danielle Crull, Bobbie Crull, Johnathan Crull, Sophie Hosier, Carter Hosier and Rider Hosier. Services honoring Lenore’s life and legacy will take place at 10 am on Saturday, July 28, 2018 in the Owens Funeral Home, 412 North Harrison Street, Alexandria with Pastor Pat Robbins officiating. Interment will follow in Park View Cemetery, Alexandria. Friends may call at the funeral home on Friday from 5 pm to 8 pm. Memorial contributions are suggested to The Community Church of Alexandria through the funeral home. The family would like to extend their thanks and appreciation to Community Hospital nurses; Rachel, Shelley, Leah, Casey and Kari, and Heartland Hospice caregivers Barbara, Racheal, Chauncy and special caregiver-Bethany Jarman. To send flowers or a remembrance gift to the family of Lenore B. (Richardson) Rector, please visit our Tribute Store. "Email Address" would like to share the life celebration of Lenore B. (Richardson) Rector. Click on the "link" to go to share a favorite memory or leave a condolence message for the family.